A rare cloud formation was spotted over Moscow this week, inciting widespread discussion of UFO sightings throughout the city – concerns which spread across the globe instantly via the internet. The British tabloid The Sun reported as a “Mystery UFO Halo” over Moscow although it was likely simply an interesting phenomenon created by planes flying through layers of thin high-altitude clouds. A "hole punch cloud" as seen over Moscow last week. Such clouds are rare and awe-inspiring as their cause is still somewhat mysterious. 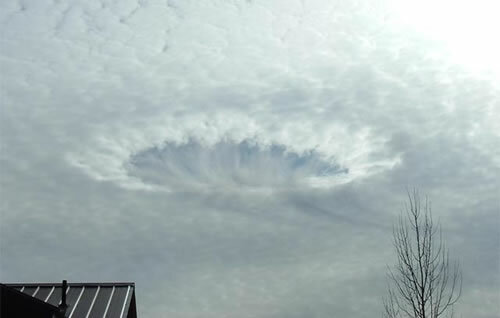 Hole punch clouds are often attention-grabbers, as they are relatively rare. When they do form, they tend to persist and are large enough to be seen for miles around. The foundation of a hole punch cloud is traditionally a mid- or high-altitude cloud type such as cirrus or cirro-stratus. Such clouds generally form above 20,000 feet or so in the atmosphere. The National Weather Service has explained that such clouds are frequently composed of both ice crystals and super-cooled water droplets – water that is below the freezing temperature but still exists in liquid form. When such a delicate balance occurs, only a slight disruption of this delicate balance may lead to a striking result. This hole punch cloud is a particularly vibrant example of both the foundational cloud form and the evaporation of the water droplets in the surrounding environment. Some hold punch clouds are even referred to as "crop circles in the sky." A hole punch cloud photographed over Alabama in 2003. Photo Source: Gary Beeler, Warning Coordination Meteorologist, National Weather Service Mobile, Alabama. Frequently, the ice crystals may slowly grow and expand at the expense of the liquid droplets. But when the balance is disrupted, the droplets may freeze instantly and thus permit the liquid droplets in the environment to evaporate, resulting in a “hole” in the cloud. It is believed that a cloud may be disrupted in this manner when a a jet flies through the thin cloud layer. Such a disruption may spur the quick freezing of liquid droplets and evaporation of other droplets. This would create the void in the space in which the jet passed through the layer. While the source of hole punch clouds may be somewhat uncertain, they are certain to cause quite a vigorous discussion. 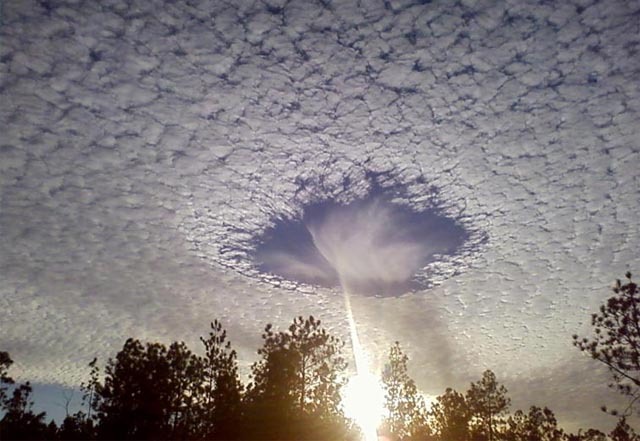 UPDATE (10/19/09): The cause of the Moscow hole punch cloud may have been discovered: cloud seeding. See Moscow Testing Cloud Seeding; Promises Winter Without Snow.